A Cultural History Faces Stringent Smoking Laws "New York City"
Of the roughly 20 hookah bars in New York City, about half are clustered along a short stretch of Steinway Street in Astoria, Queens, known as Little Egypt. Here in the hazy cafes, owned mostly by Egyptian immigrants, men smoke fruit-flavored tobacco called shisha through water pipes called hookahs as they banter in Arabic, play chess or backgammon, or simply pass the day in a fragrant fog. But big trouble has come to Little Egypt, causing the kind of jitters more often associated with the cigarette habit. Hookah shop owners say the city's Health Department has begun sending agents to Steinway Street to aggressively enforce the stringent smoking laws that took effect last spring -- laws the owners had thought they could quietly sidestep. The owners have enlisted the help of their councilman, Peter Vallone Jr., who wrote to the city's health commissioner last week arguing that the shisha cafes are no different than the cigar bars that qualify for a legal exemption from the smoking laws. Mr. Vallone said that city law allows smoking if the bars draw at least 10 percent of their revenue from the sale of tobacco. Most of the shisha café owners say they earn well over half their revenue from tobacco. But a Health Department official said yesterday that the cigar-bar exemption applied only to places that sell alcohol. 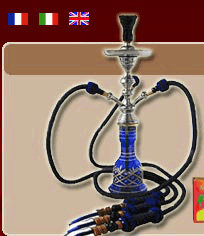 Elliott S. Marcus, an assistant commissioner, said, "Hookah establishments may apply for an exemption as a tobacco bar -- which by definition is an establishment where the sale of food is incidental, at least 40 percent of gross receipts are from the sale of alcohol, and at least 10 percent of gross receipts are from the sale of tobacco products or the rental of humidors. "To date, the department has not received any tobacco bar applications from hookah establishments," he said, adding that they were therefore subject to the city smoking ban. The cafe owners said they would not serve alcohol because most of their customers were Muslims, who do not drink. The cafe owners contend that hookah smoking is a vital part of their culture. And their shops were instrumental, they say, in transforming what was a downtrodden block several years ago into a bustling commercial strip where shops stay open late at night and people mill about on the street the way they do in downtown Cairo. Many of the cafes draw their largest crowds well past midnight. Egyptians, Algerians, Tunisians and others, mostly men, sit next to tall ornate water pipes, sipping juices, coffee or strong tea between puffs. Some like the tobacco dipped in molasses or flavored with fruits or spices. A full pipe usually costs $4 and can last an hour.